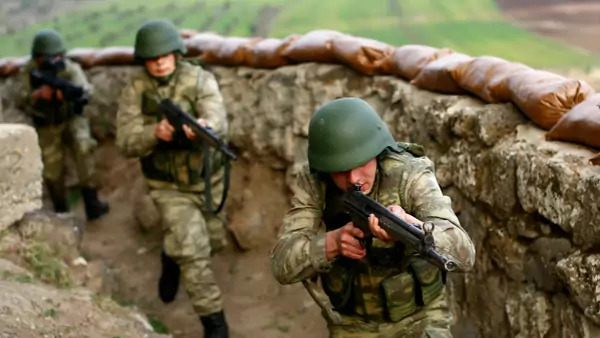 Turkish soldiers participate in an exercise on the border line between Turkey and Syria near the southeastern city of Kilis, Turkey (Murad Sezer/Reuters). Nervana Mahmoud critiques Brookings scholar Shadi Hamid’s assertion that illiberal Islam is a viable future for Muslim societies. Tarek Osman explores the relationship between Lebanese Christians and foreign protectors, especially in light of French presidential contender Marine Le Pen’s visit last month. Paul Iddon contends that Turkey, which does not wish to risk a direct confrontation with President Bashar al-Assad’s forces, no longer has any good military options, if any, in Syria now that Syrian Kurds have handed territory west of the northern city of Manbij to the Syrian army.